IT'S not every day you find thousands of people in Rankins Springs. But then it's not every day Hamish and Andy come to town. More than a thousand people packed the Rankins Springs Hotel on Tuesday night to watch the comedian duo and their band Cool Boys And The Frontman perform. The front man was Shannon Noll and they only performed one song - ACDC's It's a Long Way To The Top. Revellers crowded around the stage to sing and dance along with one patron scaling the security mesh and climbing onto the pantech before being escorted off. After the song, Hamish and Andy called up Rankins Springs resident Brent Parsons. 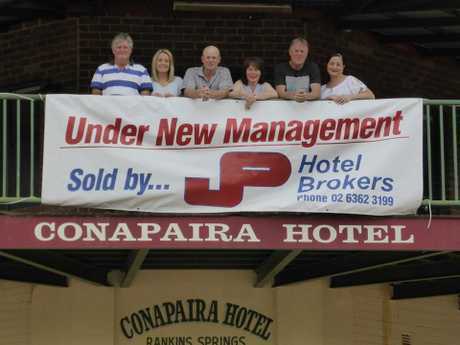 Mr Parsons submitted the submission asking the band to play at the Rankins Springs Hotel relaunch. The trio cut a red ribbon and declared the pub re-opened. The Cool Boys, minus the front man, then performed a "secret" instrumental song before getting back in their tour bus and heading to Newcastle for their next gig. People came from all over Australia to attend the event. One group made the journey from South Australia, others from Toowoomba in Queensland. One couple on their way to the east coast from Perth said they were passing through and decided to stop when they saw all the cars. Rankins Springs Hotel co-owner Kate Parsons said it was a great night. "We've over a thousand people here. Not sure on the exact number, we've run out of arm bands." EARLIER: THERE'S a good chance you haven't heard of Rankins Springs. It's a small, quiet community in central New South Wales. But on Tuesday it won't be quiet and it will no longer be unknown. Because Hamish and Andy are coming to town. 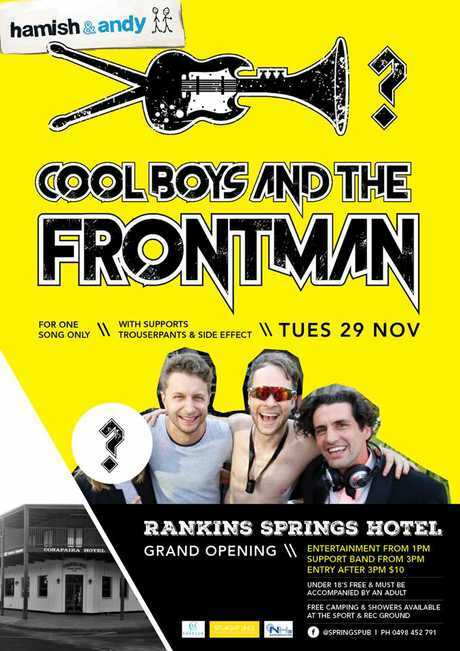 The comedian duo and their band Cool Boys And The Frontman will be performing at the Rankins Springs Hotel. But only one song and the front man is Shannon Noll. The performance is part of the Rankins Springs Hotel grand re-opening. Co-owner Col Parsons told ARM the pub closed a bit over a year ago and after no one else bought it, he and two mates thought, why not? "How it all started was me and a couple of mates, Stuart Vearing and Donald Robertson, we'd been waiting for someone else to come along and buy it. "We're quite busy with our lives but when no one did we thought, why not? "And it went from there. We bought it but it only settled last month." After some minor cosmetic work and managers installed to run the place, the pub re-opened to the public for the first time on Friday. "We needed to iron all the bugs out before Tuesday. Make sure all the beer is nice and cold coming through the taps. "We've been open for a week now. "All the town people are really positive about the place. "I call it a spontaneous meeting place. When the pub closed down you had to arrange to go to someone's place for dinner or drinks. With the pub you go in and you might run into someone you haven't seen for a month." Born and bred in Rankins Springs, Mr Parsons has some fond memories of the hotel. "Our first beer was at the hotel. We have had many a night there. We watched it burn down 18 years ago. 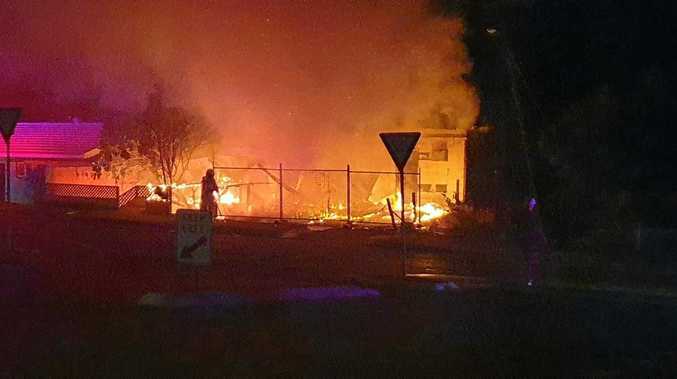 That was a crying shame but the people who rebuilt it did a great job. We're glad they built it to what it is today." Mr Parsons said he couldn't believe it when he first learned Hamish and Andy will be performing at the pub. "About three months ago my nephew heard over the radio about Hamish and Andy doing a road trip with their band and asking for people to submit a reason for where and why they should play. "He came and asked my wife and I if he could put a submission in. We said go for it thinking not a hope in hell. "But then a month ago I was out of service and then when I came back in my phone went mad with all these messages. "Hamish and Andy are going to play at the pub. Fair dinkum. They'd accepted the submission." He said Hamish and Andy have turned the relaunch into a massive event. "Not sure how many people will be there. We're budgeting about 1000 people but over supplying because we just don't know." On Tuesday, the pub will be open from 10.30am but the official relaunch will kick off at 3pm. "We've hired the Lions Club stage - a semi-trailer pantech. "We're having two bands, one probably before Hamish and Andy and a local girl singing. "The second band will come on and play just until midnight." Cost is $10 per person at the gate after 3pm. Kids under 18 free, although they must be accompanied by an adult. There will be free camping at the sport and recreational grounds with free showers and toilets. "It's doing to be a nice day. Forecast is about 32-34 degrees," Mr Parsons said. And this journalist will be there. I'll bring you pics and video from the day. You can connect with Alexia on Facebook or Twitter.